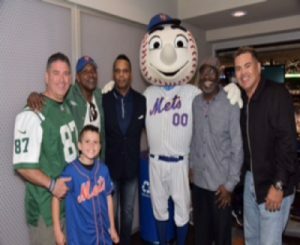 Mineola, NY (September 9, 2017) – Nassau County Police PBA President James McDermott and son Colin McDermott are pictured alongside former New York Mets Edgardo Alfonzo and Mookie Wilson along with former New York Jets players Wesley Walker and Freeman McNeil. The annual widows and orphans game night at Citifield hosts families from the Nassau County Police that died in the line of duty. The event is sponsored by the Nassau County Police PBA and Property Tax Reduction Consultants (P.T.R.C., Inc.). The owner of P.T.R.C., Inc. is a former NYPD Officer.